He’s known for his residencies in Ibiza, not his halls of residence. But Tinie Tempah is gearing up to put his own brand of cool on university accommodation — meaning students could find themselves stirring baked beans in a kitchen designed by the hip hop star. The Pass Out singer, real name Patrick Okogwu, has met influential architect David Adjaye to discuss collaborating on a new approach to student housing. “I feel that uni accommodation could be a lot more modern, modified, a lot more minimal,” he told the Standard. The rapper grew up on the Aylesbury Estate in south-east London. His brothers and sisters lived in cramped accommodation while they were studying, and he saw a chance to make his mark. “You could have all these minimal living spaces where everything is pushed into the wall so you can open out the TV, open out the kitchen,” he said. “There are all these new amazing ways of fitting things into quite a small space, so in the future I’d love to collaborate on something like that. 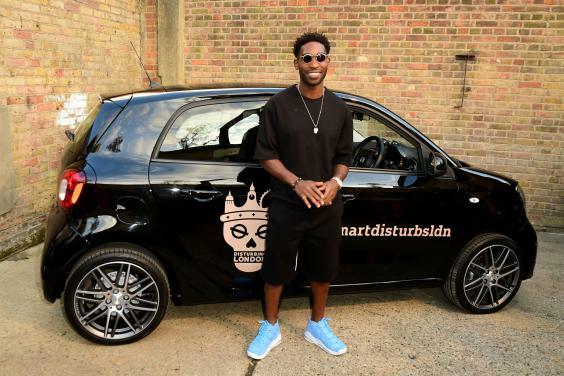 Tempah and his manager and business partner Dumi Oburota have launched two new smart BRABUS fortwo cars — a rose-gold and black matte design with rose-gold accents and leather interiors — as part of their company, Disturbing London. “It was a once-in-a-lifetime opportunity. There was an element of trying to create something that catered to youth, from our eyes,” said the grime star. “I’ve just realised how important it is to be able to have a voice in this world — a 28-year-old with a voice. I want to do right by my generation.”Oburota, who grew up in Brockley, said he saw no limits for Disturbing London, which was originally established as a record label to promote new talent: “I feel like we’ve got a voice and opinion and it’s rare that guys from London, particularly where we’re from, are allowed to influence culture. I just want to show people what we can do. Tempah is in the middle of his summer residency at Ushuaïa in Ibiza. Find details about the smart Disturbing London Editions range at uk.smart.com.